This week’s recipe was a two-parter, and judging from early reactions the barbecued pork was a hit! What did you think? Leave your thoughts and/or a link to your blog post below. 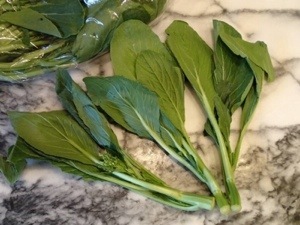 This week’s recipe utilized one of my favorite Chinese vegetables, yau choi. A fairly simple preparation, I’ve served this stir-fry alongside flank steak, pork chops, or even had it as an afternoon snack. What did you think? Were you able to find yau choi or did you have to substitute? Leave your thoughts and/or a link to your blog post below. Yau Choi. Photo by Cathy Hagin. Posted in LYL and tagged stir-fry, yau choi. Bookmark the permalink.